The sun was out with little to no wind and the trails were hard and fast for the start of the Lander leg this morning. Quite a crowd gathered at Bruce’s Bridge up Sinks Canyon to enjoy this spectacular winter day and cheer the mushers. The 27-mile Lander course had at least 9 miles of climbing. Most teams ran 10 dogs today. The location of the start can be a little intimidating but looks much worse than it really is. Actually it’s a great warm-up as the first 4.9 miles are a gradual climb and are very “lope-able.” Intimidation is a powerful force when it’s looking down on you. Lina Streeper broadened her lead today by another minute while Anny Malo pulled away from Érick Laforce. Alix Crittenden fell off the pace a bit, but managed to edge out Emilie Entrikin to maintain fourth place overall. Rachel Courtney ceded her sixth place overall to Jeff Conn by mere seconds. Rising a spot or more today were Dave Torgerson; Tommy Bird, who had a great day placing fifth for the stage; Justin Fortier; and Chris Adkins. Tommy Bird of Saskatchewan made a big move on day 5, finishing fifth on the stage. 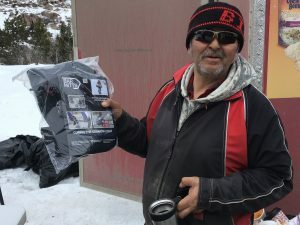 He won a set of “Musher Mitts” courtesy of the Lander sponsors of the Pedigree Stage Stop Race. Falling a bit today were Bruce Magnusson, Richard Beck, and Linda Pierce. 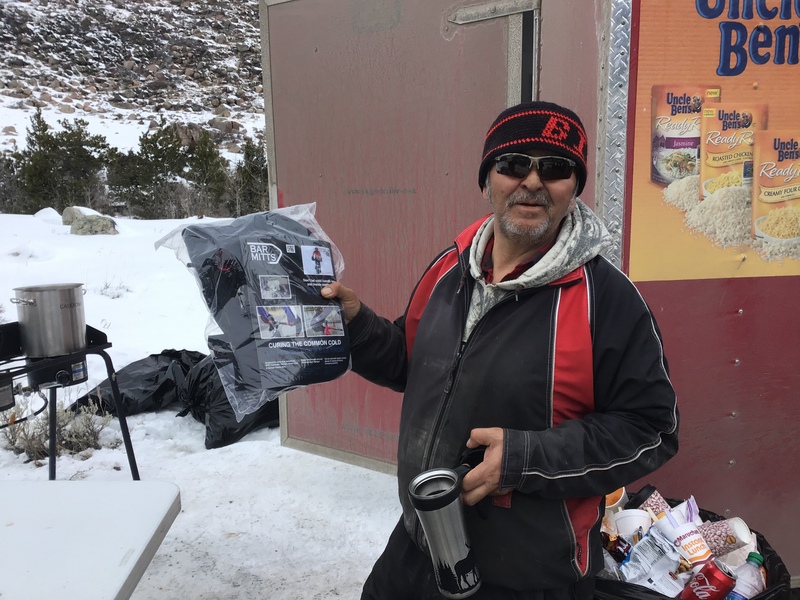 A few mushers came out even after today’s leg with the same overall position as yesterday, such as JR Anderson, Greta Thurston, Austin Forney, Fernando Ramirez, Laura Daugereau, Katherine Scheck, Tim Thiessen, and Allan Berge. So many races within this race make it fun to watch. Most positions after five stages are separated by mere seconds, making each day count all the more. One might fall an overall position in a day not by having a bad run, but because someone else had a better (or great) run. And with only two days left, there is less room for error and at the same time a chance may open up to really shake it up anywhere across the board. The overwhelming amount of amazingly talented mushers and dogs competing here at the Pedigree Stage Stop Race is really hard to describe.